Bluegrass Pundit: Valerie Jarrett on amnesty, “We have a commitment from Speaker Boehner"
Valerie Jarrett on amnesty, “We have a commitment from Speaker Boehner"
There needs to be a commitment for the House GOP caucus to out Boehner as speaker if he forces a vote on amnesty. President Barack Obama's top adviser and confidant told a group of global elites on Thursday in Las Vegas, Nevada that House Speaker John Boehner (R-OH) has made a commitment to the White House to try to pass amnesty legislation this year.After hailing the Senate's amnesty bill that the Congressional Budget Office determined would lower the wages of American workers, Valerie Jarrett, Obama's senior advisor, told attendees at the yearly invitation-only SkyBridge Alternatives Conference that Boehner would help the White House make a push get immigration reform enacted in the next three months. “I think we have a window this summer, between now and August, to get something done,” Jarrett said, according to the Las Vegas Review-Journal. 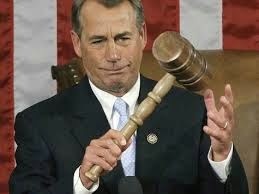 “We have a commitment from Speaker Boehner, who’s very frustrated with his caucus."